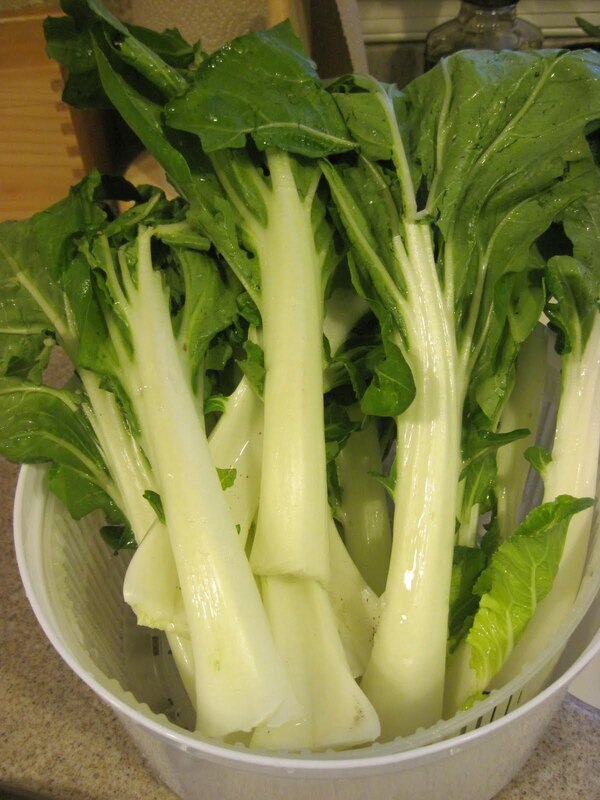 Last week, we received a small head of cabbage in our CSA box. I've never purchased a whole cabbage before. I've purchased salad mixes with cabbage, or pre-shredded cabbage, so I wasn't sure what I wanted to do with a whole cabbage head. 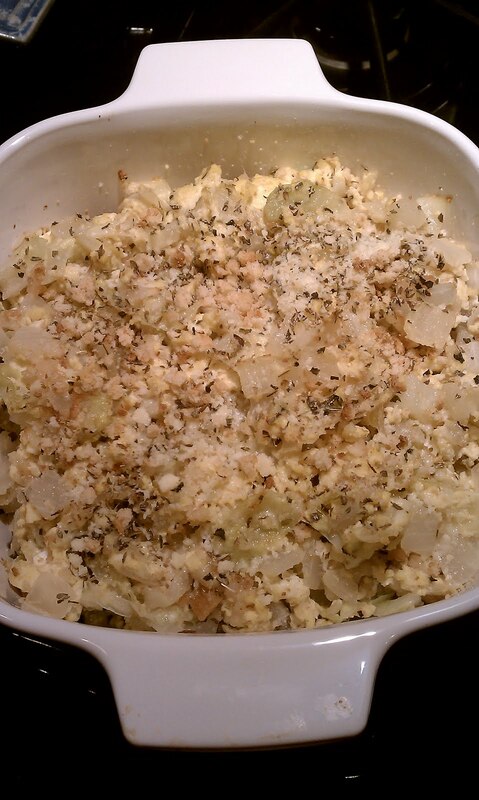 I decided to look around at some recipes, and I came up with this hybrid cabbage casserole. Both my husband and I really liked it. In fact, my husband commented a few times about how much he liked it, even a day after we had eaten it. I received another head of cabbage in this week's produce box, and I think I'm going to make this again! Melt butter in large frying pan over medium heat. Add in cabbage and onion, and cook for about 10-15 minutes, stirring frequently, until softened. Meanwhile, beat 4 eggs in a small bowl. Add in milk and cheese. Cook for approximately another 5 minutes, until milk starts to boil. Slowly add the beaten eggs to the vegetable and milk mixture, stirring as you pour in the egg. Add in bread crumbs, basil, salt and garlic powder. Cook for another 5 minutes. Put mixture into a small casserole dish. Sprinkle top with dried oregano, parmesan cheese and a few tablespoons of bread crumbs. Put into oven and bake for about 15-20 minutes, until bread crumbs on top begin to brown. I've had a photocopy of this recipe for years. I think it was from Cooking Light magazine, but I'm not entirely sure where it came from. It's a really simple but tasty recipe. Having the meatloaf already divided into pre-measured portions makes it easier to serve, and makes for a nice presentation. It's also easy to freeze any leftover meatloaf muffins. 1. Preheat oven to 375. Coat muffin pan with cooking spray. 2. Mix meat, egg, oatmeal, parsley, 2 tbsp ketchup, milk, onion, salt & pepper in a large bowl. 3. Form the mixture into 8 balls & place in prepared muffin cups. 4. Combine 2 Tbsp of ketchup & Worcestershire sauce & spread ½ tsp over each mini meatloaf. 5. Bake the meatloaves until their internal temp reaches 160 degrees, about 25-30 minutes. Wash turnips and greens, then peel turnips and cut off root end. Cut off greens and set them aside. Cut turnips into small pieces (for some of the larger ones, I quartered them, others I just cut in half). Cut up three green onions. Heat up a frying pan with 1 tablespoon butter. Add turnips and green onions and cook for about 8-10 minutes, turning occasionally, until the turnips begin to turn golden brown. While the turnips are cooking, break the stems off the washed greens and cut up the mushrooms into slices. Add the cut mushrooms and rosemary, along with 1 more tablespoon butter. Cook for about 5 more minutes. Add in the turnip greens and cook until the greens are wilted. Sprinkle with sea salt. This blog post comes from a recipe request from one of my good friends, Natalie. After catching up over the phone the other day, she mentioned really liking salmon cakes. I'm also a fan of salmon cakes. I've tried many recipes, but this is BY FAR my favorite one. I told her she had to try out this recipe, so I thought I'd share it with everyone. I don't know what it is about this particular recipe, but it makes the tastiest salmon cakes every. I swear! It's really easy to make, and the dill sauce is quite delicious, too. 1. Preheat oven to 450. Coat baking sheet w/ cooking spray. 2. Heat 1 ½ tsp oil in a large skillet over medium-high heat. Add onion & celery; cook, stirring, until softened, about 3 mins. Stir in parsley; remove from heat. 3. Place salmon in medium bowl. Flake apart with fork. Add egg, & mustard; mix well. Add onion mixture, breadcrumbs and pepper; mix well. Shape into 8 patties. Combine all above ingredients in a small bowl and mix well.